This entry was posted in Family Safety, General, Gentle Discipline, Natural Learning and tagged behavior, children, discipline, punishment. Bookmark the permalink. Natural Consequences are often talked about as the go-to gentle alternative to punitive actions like time-outs or removing privileges. Using natural consequences can, in fact, be an excellent parenting tool, but sometimes resorting to natural consequences may be ineffective and downright dangerous. The goal of using a natural consequence is to allow a related consequence to our child’s actions to happen without our interference as a way for them to learn about their choices. A child runs into a busy road… … the child may be hit by a car. A child plays with lighter, matches… … the child may burn his or her hand or may cause a fire. A child finds an axe and tries it out… … the child may get seriously hurt. A child finds and swallows pills from a cabinet… … the child may get very ill, or worse. In the examples above we see that allowing our children to get hit by a car, being burnt, hurt or ill are not positive or effective ways to use natural consequences. “Danger Discipline,” such as dealing with fire, medicine, tools and street safety, is not a good contender for natural consequences and can be taught to children through safe and effective means, such as playful games, modeling, being pro-active, and providing supervision. So, what are some instances when natural consequences are a great way for children to learn? A child refuses to wear a rain jacket outside… … the child gets wet. A child throws a toy on the ground… … the child cannot play with the broken toy any longer. A child spills his or her drink… … the child helps to clean it up. A child leaves toy in the rain… …the child needs to wait until it is dry to play with it again. Sometimes, we may wish that a natural consequence would help our children change their mind or learn not to do something again – This will not always be the case. For example, a child may not mind being wet in the rain or having cold ears because they refuse to wear a hat. If you would like to use natural consequences but find that your child is not changing their behavior, it might be a signal to you that what you wish and what your child is comfortable with may not be in sync. This is actually often okay and may just be a matter of parental acceptance of our children’s individual needs, wishes, or tastes. If you find yourself allowing natural consequences to happen for something that you hope to change in your child’s behavior or choices because it is not safe or not in line with your family values or limits, and it is not working as you had hoped, there may be so much frustration that you get angry, forgetting your gentle parenting intentions and turning to punitive consequences. In such cases, if you are aware of your frustrations and how your needs and your child’s needs are not matching up, it may be better to try something else like problem solving, a family meeting, or setting a limit with kindness instead. 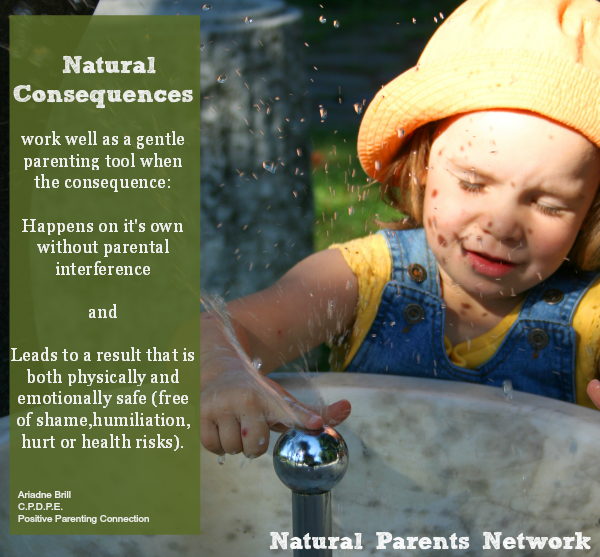 Natural Consequences can work very well as gentle parenting tools when the consequence happens on its own without any parental interference and when the consequence leads to a result that is both physically and emotionally safe (free of shame/humiliation/health risks). 2 Responses to Is That Natural Consequence You are Allowing Really a Good Discipline Choice? I think you’re right to be wary of getting frustrated. The other thing I think one has to be careful of is not being mean. Like the toy left in the rain – if you spot it and leave it out there, your child may see you as *letting* that happen (which is different from them forgetting it and you not noticing it either). That can seem like you’re not on their side. If my partner left a book out in the garden I might roll my eyes but I don’t think I’d deliberately leave it to get wet, so I wouldn’t do that to my kid either. I experienced the flip side of natural consequences, what you might call “danger discipline,” the other day when we were getting ready to go outside. My three-year-old refused to put her snow boots on–bear in mind it was 10ºF outside with snow on the ground–so I let her walk outside thinking she would immediately return in to put her boots on. Instead, she began walking over to the car nonchalantly as if her feet weren’t even cold. I mention that story just to agree with your point that sometimes allowing a natural consequence doesn’t work out the way you think it will. In that case, I of course brought her back in and insisted she put on her boots, explaining the dangers of cold feet. Three is a stubborn age!